How viable is pet insurance? Worth the Cost? Or simply an exorbitant expense? All insurance policies have a tendency to be fairly confusing – even the ones designed for your furrier family members. Pet policies aren’t equal across the board, and with various limitations, exclusions, caveats and fine-printed-disclaimers in each prospective option – it’s pretty easy to select a plan that doesn’t cover everything. Everything you’ll need, at least. Pet owners’ major argument is that it’s more cost-effective, more manageable and more prudent to set money aside in a “pet emergency account”, than it is to shell out regular pet insurance premiums. Well, the American Pet Products Association estimated the nation’s veterinary bills cost between 14.3 and 15.2 billion dollars in the last couple of years. And they’re rising all the time. So, obviously – and notwithstanding the common complexity of pet insurance plans – the right policy may actually be the budget-friendly alternative. What Do We Mean By The Right Pet Policy? Pet insurance plans vary greatly. And the right information can help you ask the right questions, follow the right guidance, and sign up for a plan that meets all of your expectations. Pet insurance policies are created for both dogs and cats, but a lot of plans are really geared toward dog owners. Dogs, historically, lead more dangerous, active lifestyles – increasing the risk of injury – whereas cats tends to spend a lot of time indoors. Don’t let that discourage you from seeking coverage though, if you’re a cat owner, as cat coverage is often less of an expense. Your pet’s age will make a major difference in which policy you choose to purchase. Premiums are usually lower for younger pets. There are plans available for animals of any age, but rates do tend to go up as animals get older – and they’ll be harder to find. So if you enroll early, your monthly premiums will be correspondingly lower. Pet insurance policies have been available everywhere for a long time, yet they’ve only become popular here since the 80s’. In fact, experts estimate a mere 1% of American pets have insurance coverage at all. There are three main categories of plan coverage available to pet owners: Accident insurance, Accident and Illness insurance, and Accident, Illness and Wellness insurance. A lot of people favor the second option – covering potential accidents and illnesses – as they prefer to handle preventive care, or wellness, themselves. So what’s the verdict? 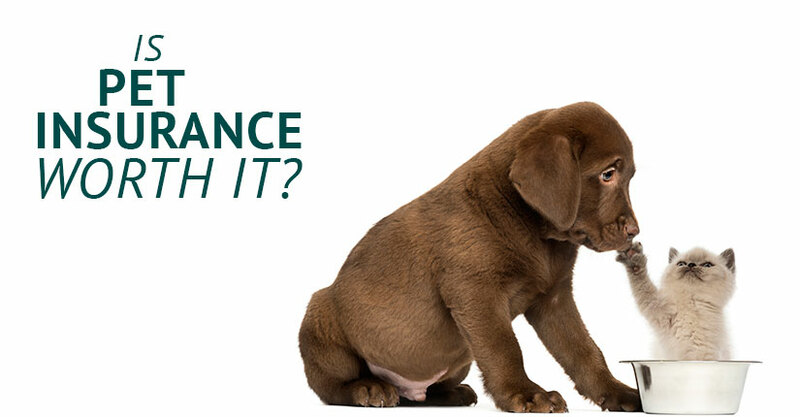 Is pet insurance worth the cost? Of course, it all comes down to the fundamental reason for getting any coverage at all: you really don’t want to leave it to chance. Unforeseen expenses, surgical procedures, operations, medication, long-term treatments – they can quickly break the bank, adding one more major worry to an often-emotional experience. With the right pet insurance plan, however, you (and every member of your family) can work it out with a lot less stress. When selecting a plan be sure to find out what is, and isn’t, covered. Ask about any waiting periods as well, to be certain you’re covered when you need to be. Read the fine print, check into ratings, ask questions, take suggestions – and don’t sign up until you know exactly what you’ve got. You’re bound to have questions, want details and need to see the specifics. So reach out to a professional and let’s get started. There’s no valid reason to leave your pets unprotected.